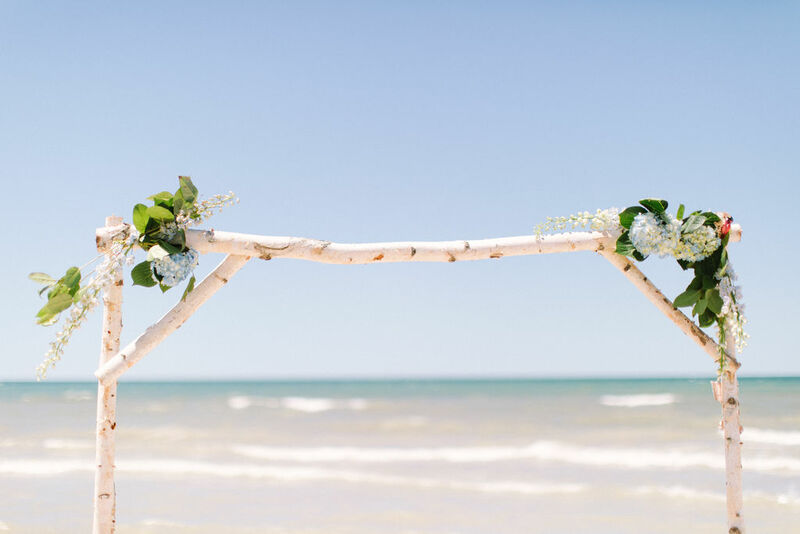 So many people dream of getting married on the sandy beaches in the Mitten State, but very few actually execute due to the many challenges that come with planning beach weddings in Michigan. As a Michigan wedding planner with a special love for beach weddings, I know all about navigating the ins and outs of lakeside weddings. Below are my best tips and tricks for planning and executing a beach wedding in Michigan. Lake Michigan weddings can be beautiful but sometimes hard to find the right location. First you need to decide if you want your wedding in a public or private area. You may be surprised to learn that not every beach in Michigan allows weddings. The best way to go about learning what beaches are your options is to select the beach you have in mind and call the city or chamber of commerce in the area for more information. Some beaches require that you get a permit to host an event, while others allow weddings on a first come, first served basis. I cannot stress enough how important it is to learn the rules and get the required permits before your wedding. Just showing up and winging it can be extremely risky and could cause massive upsets on your wedding day. Another thing to keep in mind with public beaches, is most of the time you need to claim your space before the sun bathers and beach goers cozy up for the day. The best way to go about this is to designate a family member or friend to go claim your spot early in the morning (I’m talking 9am or earlier) and stake it out with wooden stakes and caution tape. 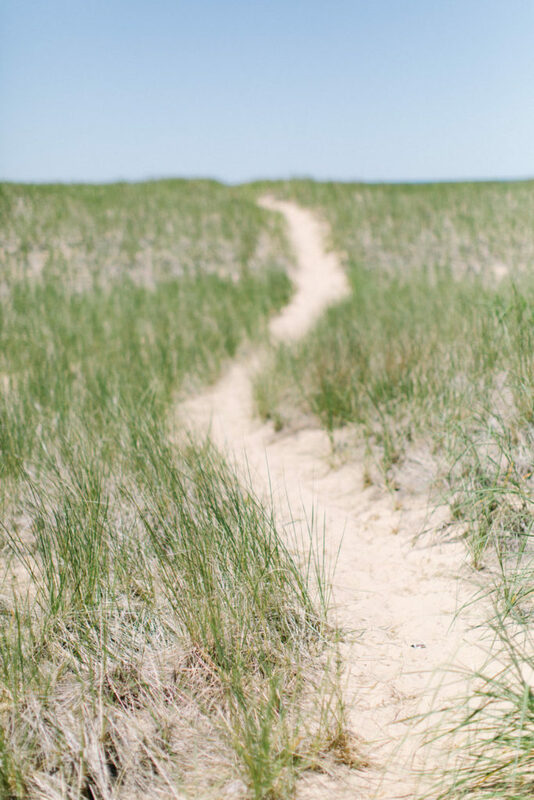 Finding private beaches in Michigan that allow weddings can be challenging, but it can be worth the search and extra investment to not have the stresses of a public beach. A few of my favorite private beach wedding venues in Michigan include Camp Blodgett, The Leelanau School and The Elberta Life Saving Station. One downfall to private beaches is most of the time the beaches or lake front is much smaller than public locations so you will have to carefully consider your guest count. Another thing to consider with private locations is the neighbors. You would hate to be half way down the aisle as the neighbor is blasting music during their beach bash. So maybe chat with the neighbors and see if you can time your ceremony around their day. Remember, they live there and have earned the privilege of having fun also—so try to be nice. Many people shy away from Michigan beach weddings because of all the extra logistics. I am not going to lie to you, a beach wedding will add a whole extra load of work and stress to your plate, but the more prepared you are the less you will stress. Is there enough parking for everyone? Do I need rent a shuttle? Can the shuttle easily get in and out of the parking location? How far away is parking from the wedding? Will guests know where to go? Help your guests have a smooth experience getting to your wedding and don’t leave them confused and stressed. I recommend walking through the whole experience yourself. Start by driving to your wedding venue or location, to parking, to finding the ceremony, to finding the reception and more. Wherever you sense a slight bit of confusion or wonder where to go, make a sign to guide guests through it. It can be as simple as a foam core board with a big arrow stapled to a tree. Guests don’t care what it looks like, they will be so thankful they didn’t have to guess where to go. Your sound and music can be thrown off by so many factors, which we will talk more about in the weather section. Hiring a good DJ or band that has sound equipment is going to be such a weight off your shoulders. If you are having a smaller ceremony and want to save on sound equipment a great option is this portable speaker and microphone*. When brainstorming decor and rental options for your beach wedding, there are a few things you want to keep in mind. Think about what is going to be sturdy and hold up against the elements. Although foam core signage on an easel is cute, it will blow away in the wind within minutes of putting it up. You want to weigh everything down or find a container or basket to put them in. Ask your rental company for guidance of how items are going to stay in place and hold up against the elements. Most rental companies will charge a “beach hauling fee” for beach weddings since it is so much more labor intensive. These fees can be sometimes up to a 20% addition to your total costs so consider this before going to crazy with your rentals. Heaters seems like a great idea in colder months, but when it is super windy the heat is just blown away. If having a tent I HIGHLY recommend renting sides for the tent as a backup option. Think about how you are going to power everything. Do you need to rent a generator or will your power source be efficient? The weather over the Great Lakes can be extremely unpredictable. It can be sunny and 75 degrees one minute, then downpouring with 20 mph winds the next. Basically, you need to prepare of everything and anything. Rain off Lake Michigan can come quickly and with the area being very open, there is very little shelter to hide from. This makes having a back-up plan essential. What is your backup location if it is raining? Will you still have an outdoor ceremony and reception if it is misting or lightly raining? You may want to consider renting or buying white umbrellas* for guests to take cover under for potential rain. I always say wind is the secret element that people forget about when it comes to a beach wedding. Remember the wind can be just as powerful as the rain. High winds can cause massive waves that can make your beach smaller or sometimes non-existent (this actually has happened at one of my weddings!). Wind can also blow sand and cause sound issues. Skip wearing a veil – trust me they blow away. Or if you really want it, make sure you secure it in tightly. Have a back-up plan if the winds are too strong. Have a solid sound system or accept that guests may not be able to hear if its too windy. The sand can get super hot so I would recommend buying or renting an aisle runner. 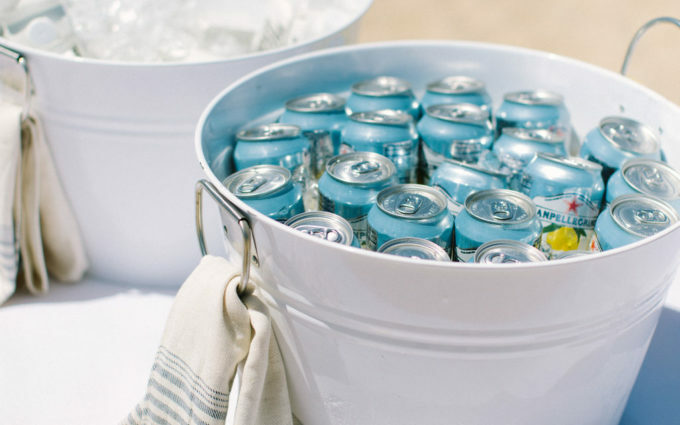 A flip flop basket with an assortment of flip flop sizes can also be an awesome way to help people’s feet avoid the heat and make your guests feel special. Having a water and lemonade station is a great way to make sure everyone stays hydrated. Here are links to my favorite mini water bottles* and sparkling lemonade* pictured below. Just as it can be pretty hot, it can also be very chilly, especially in the spring and fall months. Let’s say there are 25 MPH winds, sideways rain and lightning everywhere and you have to resort to plan B, C or D. How are you going to let your guests know that you are no longer having the ceremony on the beach? Mass text? Wedding website? A sign? It’s important to make a plan for this ahead of time. The best times of the year for beach weddings in Michigan are June-September. Though these months don’t guarantee you perfect weather, they are normally the safest months where you can hope for sunshine. Anything beyond those months your risk of rain, cold temperatures and wind increases. Avoid holiday weekends – hotels are at peak rates and everyone is trying to hit the lakeshore. Avoid festivals and big events in town – these can also drive up the hotel rates and the traffic in the area. Find the weekend before or after “peak time” – this can be a big money saver for you and your guests and help the traffic to be calmer in your coastal town. Typically this is the weekend before school gets out or weekend after school is back in session. If you decide you want to elope, this makes planning your beach wedding in Michigan that much easier. You can basically go anywhere you want and don’t need to worry about obtaining a permit. Some of the best spots to for a Michigan beach elopement are Pictured Rocks National Lakeshore, Sleeping Bear Dunes, Mackinaw Island, Isle Royale and more. As much as I am manifesting sunny, 75 degree temperatures with no wind and all the sunbathers busy at a swimsuit sale 2 miles away – things can go wrong. Beach weddings are risky. No sugarcoating it – there are so many more things that could go wrong compared to other weddings. Problem: It is so windy the tent blows over. Solution: if it is early enough in the day, call the rental company ASAP (make sure you have an emergency contact) and have them come out and fix the problem or relocate the tent. If it is too late then resort to your indoor back-up plan and put up a quick sign to let guests know where you are relocating. Be calm and be chill. Problem: It is raining and guests are about to arrive. Solution: Resort to your backup location (under the tent, an indoor location) and put up a sign to let guests know where you are. Or if it isn’t a heavy enough rain, pull out all your white umbrellas and designate someone to pass them out. Ask your ushers to grab a few towels and wipe down the seats. Be calm and be chill. Another thing to mentally prepare for is the people and the area. Though we hope that people will notice there is a wedding ceremony happening and they will turn down their music or pause their beach volleyball tournament that is not always the case. Expect people to sunbathe 5 feet from your guests, zoom by on their boat or swim in the background of your photos. If you love the beach, you understand that others do too. To tell you a little story, I once was coordinating a wedding on an inland lake in Michigan on Memorial Day Weekend. It was 30 minutes before the ceremony started, and I was frustrated by the number of boats floating 50 feet from shore, anchored off as if they were getting a front row seat to the ceremony. When the ceremony started the boaters turned down their music and quietly watched the ceremony. And when the officiant announced them husband and wife the boaters cheered, honked their horns and toasted the new couple. It was a really cool thing to watch and totally changed my perspective on guests vs. bystanders. So when you want to get frustrated by the parade of boats and sunbathers, remember they are getting what they need out of summer as are you and your guests. Those are my tips for planning beach weddings in Michigan. 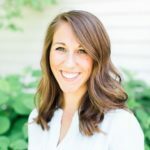 If you loved these you are going to love my Ultimate Checklist to Beach Weddings in Michigan – use the code BLOG10 to get 10% off your order! If you’d like help planning your beach or lakeside wedding, the team at Stellaluna Events would love to help. Let us organize your contingency plan, reserve the perfect beach space, and reduce your day-of stress. 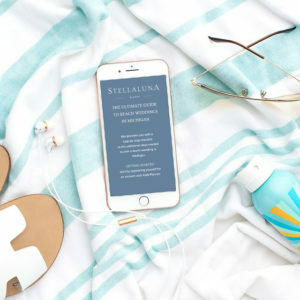 If you are looking to plan your beach wedding in Michigan then you will love our Ultimate Checklist to Beach Weddings in Michigan available on the Stellaluna Shop. Use the code BLOG15 to get 15% off your purchase! For more beach weddings, check out this Whimsical Lake Michigan Wedding and Lake Michigan Engagement Shoot.